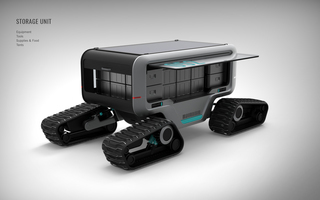 POLARIS is a modular vehicle platform designed for research in permanent frost zones, developed by Carlos Schreib in consultation with experts from the Alfred-Wegener-Institute. 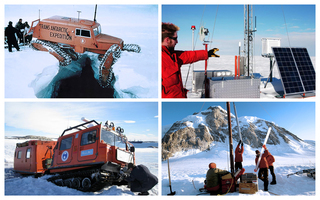 Research in the polar regions is vital to our understanding of the planet and climate change. 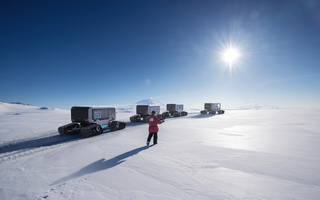 But working in the most hostile environment on earth presents difficulties, one of which is that no vehicles have been created for this specific terrain. 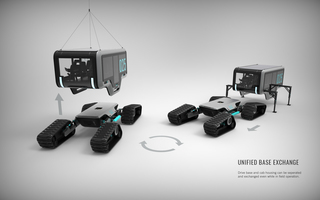 The trucks currently used in these missions are meant for ski slopes with regular inclines, not rugged surfaces with deep holes and ice boulders. 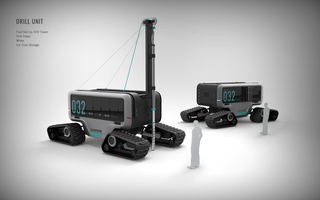 In addition, the logistics of transporting material to these remote places are complex and expensive, therefore any decrease in size or fuel consumption is an asset to the overall mission. 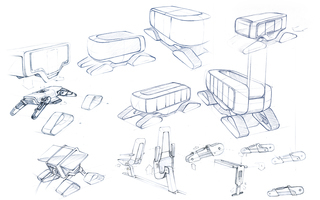 POLARIS consists of specialized units with identical drive modules to be assembled as the situation requires. 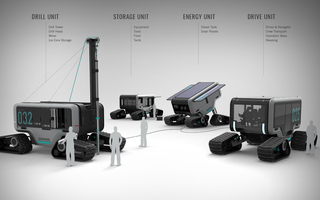 The main vehicle is controlled manually, while the other modules are autonomous. 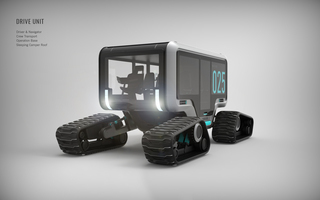 The modularity is enhanced by the separation of the housing and drive base, which is interchangeable with all vehicles, a simple concept which opens up a variety of activities in several areas. 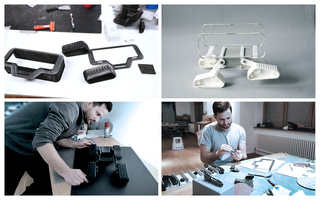 Their dimensions are adapted for aircraft and container ships, a space-saving innovation. 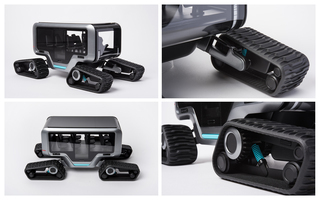 The adaptive track system ensures agile movement over rough terrain. 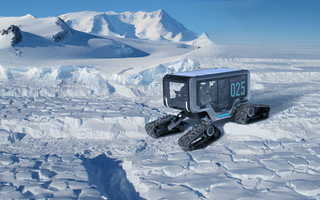 The suspension is driven by electric motors, each of the four tracks adjusting individually in height, a perfect solution to safely traversing the rugged Antarctic landscape with its glacier crevasses and other dangers. 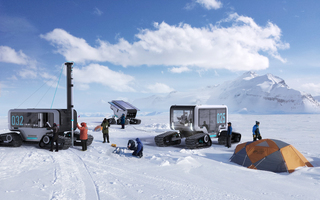 The drill unit is designed for rapid assembly and disassembly, which previously took several hours, and for the first time, a temperature-controlled stowage for the ice cores is integrated into the concept. 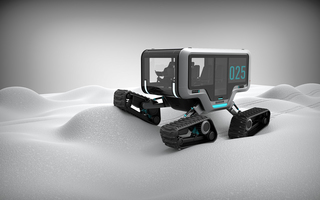 For maximum fuel efficiency, POLARIS uses a hybrid diesel- and solar-drive system. 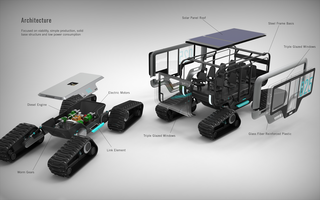 The diesel engine feeds the electric motors which power the adaptive track system while solar panels power locomotion and interior heating. Solar panels are particularly efficient in low temperatures, and since the sun never sets during summer, energy yield is optimal. 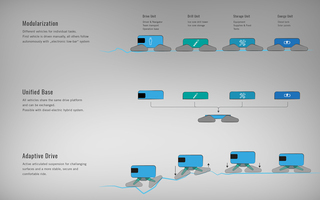 Moreover, during extended drilling periods the energy unit can be tilted towards the sun then connected to other modules. 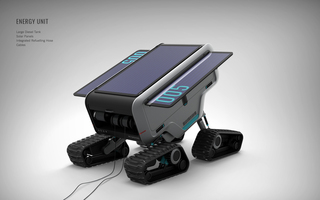 These can now shut down their motors and, again, save energy.